The EU Water Framework Directive (WFD) brings an integrated approach to managing water quality on a river basin (catchment) basis, in order to protect and enhance both ecological and chemical quality of rivers, lakes, groundwater, estuaries and coastal waters. At the Marine Institute we implement, on behalf of EPA, the monitoring programme for coastal waters, and for some transitional (estuarine) waters. We have responsibility for monitoring some of the quality elements, including priority substances and other physico-chemical elements, macro invertebrates and phytoplankton. View overview of the overall national WFD monitoring programme. Since 2013, the Shellfish Waters Directive has been subsumed into the WFD. 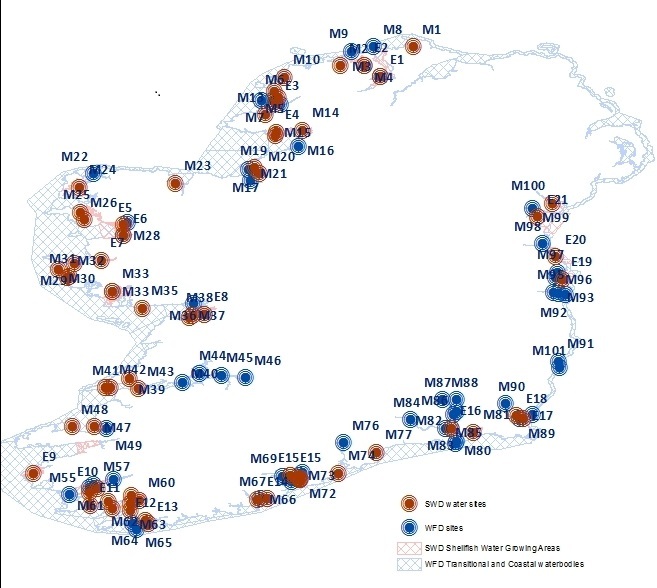 Nevertheless, an extensive monitoring programme for chemical and microbiological parameters remains in place to ensure the quality of designated shellfish waters around the coast. View locations of monitoring sites and our latest publication on compliance monitoring in water and biota.